An Oriant, France (CNN) -- At a busy creperie amid the cobbled medieval streets of Quimper in Brittany, northern France, a lunchtime crowd is enjoying hearty galettes packed with combinations of meats, cheeses and eggs. The crepe has become a staple of French cuisine, but another aspect of Brittany's culture -- the region's unique language -- is in danger of dying with an aging generation of Breton speakers. Almost two million people spoke Breton at the beginning of the 20th century, according to Ofis ar Brezhoneg, the Breton Language Office. That number has now declined to around 250,000 according to UNESCO, which lists the language as severely endangered. But the latest figures may already be out of date. Most Breton speakers are now in their 70s or older and the language is estimated to be losing around 10,000 speakers a year. "The Breton language is the main aspect of our culture, our identity," Fulup Jakez, head of Ofis ar Brezhoneg, told CNN. "If we lose our language we lose everything." 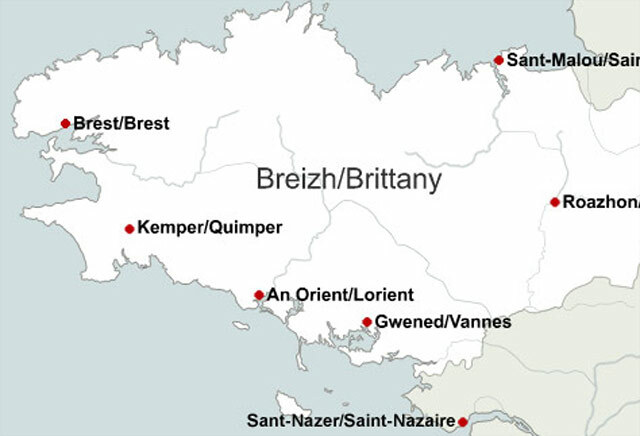 Brittany -- or Breizh in Breton -- has always had a seperate identity to the rest of France. The northwestern peninsula was settled by Celtic migrants who arrived from Britain in the fifth and sixth centuries AD. The region remains proud of its heritage with a rich tradition of Celtic music and culture that shares more in common with Cornwall, Wales or Ireland than France. Explainer: Who are the Bretons? How are you? : Mat an traou? What's your name? : Petra eo da anv? Although Brittany came under French rule in the 16th century, it was only after the French Revolution in 1789 that the country's regions were properly incorporated into a unified state. Central to that process was the use of French as the country's official language, with revolutionary thinkers stating that regional languages represented the "barbarism" of the past and needed to be "obliterated." Brittany and other regions, such as Corsica, Alsace and Basque areas in the southwest, are still living with the consequences today. "According to article two of the French constitution, there is only one language of the republic. Collective rights are not recognized; the Basque speakers in France are invisible," Paul Bilbao, a Basque language campaigner, told CNN. Bilbao said the situation in France was worse than in many other European countries with linguistic minorities such as Spain and the UK. France is one of few states not to have ratified the European Charter for Regional and Minority Languages; a treaty which is considered crucial by campaigners for the protection of the continent's linguistic diversity. Some go further still, drawing a comparison between the lack of official recognition for Breton and other regional identities and French attitudes to minorities highlighted by the recent deportations of Roma migrants and the banning of Muslim headscarves. "France is not at ease with diversity at all. It's part of the French political culture to be scared of the outside and to be scared of the inside as well," says Breton journalist Yann Rivallain, editor of ArMen magazine. For Breton speakers, the lowpoint in the region's relationship with the French state came after World War II. Many activists were accused of collaborating with the German occupiers -- and killed. For years afterwards, the language was banned in schools, with playground notices reading: "No spitting on the ground or speaking Breton." "At that time, Breton did not exist in society," says Jakez. "It was a private language you spoke at home or with your friends. There was no place for the language in public life. It was something hidden." Many parents simply chose not to pass on a language which was seen as representative of a backward culture, fearing it would give their children a disadvantage in life. Rivallain sees parallels with the struggle of recent immigrant groups, such as those from Arab backgrounds, to integrate into French life. "The idea was if you give up your language, your background, your traditions, you're going to have access to these amazing things that are part of being French. And the second and third generation are realizing that it's not happening at all," he told CNN. "The same thing happened here. They asked my parents to give up everything. They said you're going to get jobs, you're going to have a modern way of life, but for a long time it didn't happen." More recently however, Breton activists have benefited in their efforts to promote the language from the support of local organizations and politicians more sympathetic to regional issues. Bilingual road signs have become commonplace, while Lorient's (An Oriant in Breton) Interceltique Festival has become an annual celebration of Breton music, culture and identity. Significantly, in 2008 the French National Assembly voted for a constitutional amendment recognizing regional languages as "part of French heritage." Last week, lawmakers also launched a regional languages bill which, if passed, would commit the state to providing regional language lessons to all children. Davyth Hicks of Eurolang, which lobbies the European Union on language issues, said the bill was encouraging but faced an uphill task to become law. "It's exactly what's needed to help safeguard France's regional languages and help them in their efforts to avoid further endangerment," said Hicks. "France should join with the rest of Europe in nurturing its own linguistic diversity, not destroying it. France claims to be the creator of modern human rights, but you have no rights in France as a Breton or Corsican speaker." The French state is playing the clock. We're going to move from 200,000 speakers to 70,000 in the next 10 years so the situation is very fragile. But Xavier North, Delegate General for the French language and the languages of France at the Ministry of Culture and Communication, told CNN that the French government was spending one million euros a year to promote regional languages, by hiring bilingual teachers and funding organizations such as Ofis ar Brezhoneg. North said there were already 400,000 school children taking lessons in regional languages throughout France. The situation in France was very different to other European countries with 75 languages spoken in all French departments and territories, including 15 regional languages, he added. By officially recognizing these, North said, "the very essence of France would be put into question... France faces a difficulty in recognizing all of these languages. Historically speaking, France has been built on French." But with Breton numbers dwindling so fast, campaigners such as Rivallain fear political recognition may have come too late to halt the language's demographic demise. "The French state is playing the clock," he says. "We're going to move from 200,000 speakers to 70,000 in the next 10 years so the situation is very fragile." In the frontline of efforts to keep Breton alive are schools such as the Skol Diwan An Oriant. "Diwan" is the Breton word for "seed" and the name for an educational initiative intent on planting fluency in the language in future generations. Catering for childen from nursery age to Baccalaureat level, Diwan children are taught almost exclusively in Breton. "(There are) less and less older people still alive still speaking Breton. So it's very important if we don't want to see the language die, we've got to teach a new generation how to speak, how to write, how to read, how to understand Breton," head teacher Valerie Le Gal told CNN. As the older Breton-speaking population passes away, Rivallain is hopeful that a new wave of speakers can reinvent the language as a vibrant and self-confident assertion of Breton identity in the 21st century. "You're seeing the first generation of people coming through who were brought up bilingually in the schools; in the last three or four years you hear Breton spoken all over the place," he says. "People go into bars and speak the language and that's very exciting. It normalizes the language." Eliane Bramley, a parent at the Skol Diwan, is one of those who never had the chance to learn Breton as a child, even though it was her father's native tongue. Now she is learning the language with her four-year-old daughter, Aziliz. "We want her to have some Breton roots, out of respect for her grandfather who was punished at school if he spoke Breton," says Bramley. "She's started to sing a lot in Breton, and to count. We see a blackbird or a dog and we say it in Breton and she corrects me. And my father is absolutely delighted to hear some Breton songs at home. I can see he is a little bit emotional about it."